Heading out from the city centre, you initially pass through recently developed Grand Canal Dock. This is a vibrant area, entirely unrecognisable from the industrial wasteland it was a decade before. The coast is quickly reached where the shallow strand of Sandymount appears. The iconic sight of the Poolbeg chimneys present themselves, and if you wish to detour to the lighthouse, simply head towards them along the path at Irishtown Park. Continuing along the bay is simply a case of following the coast from this point, and no navigation need be worried about. There is a lovely park between Booterstown and Blackrock village that is worth taking a detour through if your not in a hurry. Just beyond Blackrock village, turning left onto Seapoint road brings you sweeping past a restored Martello tower and into the harbour town of Dun Laoghaire. This is a populous area, but the coast road never presents a problem for cyclists. The route takes a slight detour in order to pass the famous 40 Foot bathing area, and the James Joyce museum, housed in a restored Martello tower the writer briefly lived in. Winding left just before Dalkey Castle, the tiny fishing port of Bullock Harbour appears, and if your lucky, theres a good chance you’ll spot some seals lazing in the sheltered water. 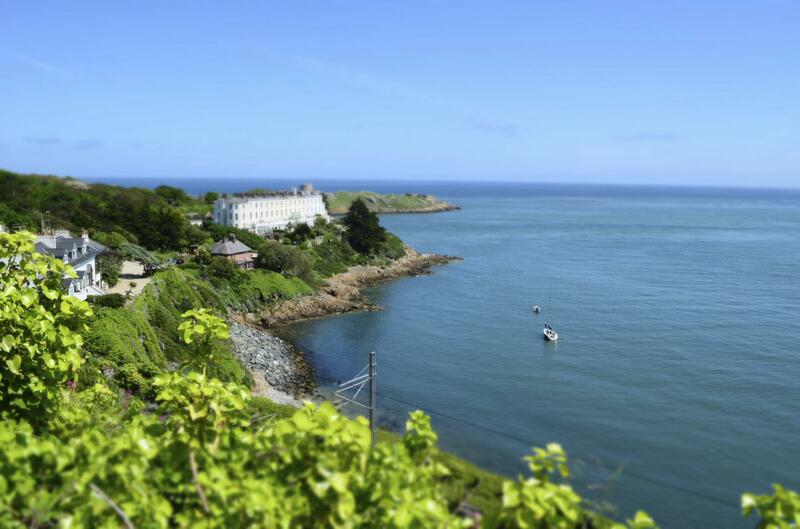 There’s a brief climb up to Dalkey village, and on to the picturesque Collimore harbour and its views of Dalkey island. Up until this point the cycle is very easy and flat, and apart from possible bad luck of a headwind along the coast, no cyclist should feel challenged. It does however change a little here. The Killiney headland is formed from tough granite, hence the quarry at its apex which supplied the stone for all the harbour constructions you have passed. From this point the coast road ramps up to a very high gradient. Although this climb is no more than three kilometers, it is a high enough gradient to test a cyclist of any level. Its worth the effort however, as the views that reveal themselves at each turn become increasingly spectacular. 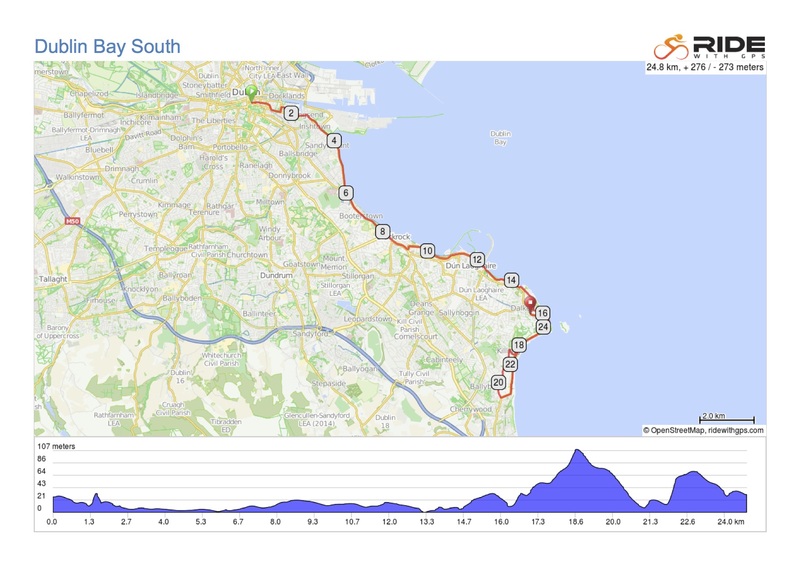 The final reveal on Vico Road of the entire bay from northern Howth, to Bray and even Greystones in county Wicklow is guaranteed to take your breath way if the climbing hasn’t. Needless to say, what goes up, must come down, and some care needs to be taken on the screaming descent from Killiney Hill. Be aware of the road signs as there are a number of hidden junctions on this short descent, and the unseen merging traffic actually has right of way. In no time at all you will find yourself on the military road and turning back by Killiney Dart station. Just beyond the station is Killineys stony beach which is well worth a visit. Anyone not feeling inclined to tackle another climb may take the frequent trains here, which allow bikes free of charge. If you feel up to another climb, rounding the corner at the end of the station road reveals a short but remarkably steep hill which winds past non other than Bono from U2’s home. With a little bit of effort, the views appear once more, before descending on the road you ascending and finally arriving in the charming village of Dalkey. From here its possible to get the Luas train back to the city center if you don’t fact the return leg. See timetable and prices on www.Irishrail.com. There are several beautiful harbours on the south side which are tremendous places to relax and enjoy the scenery. 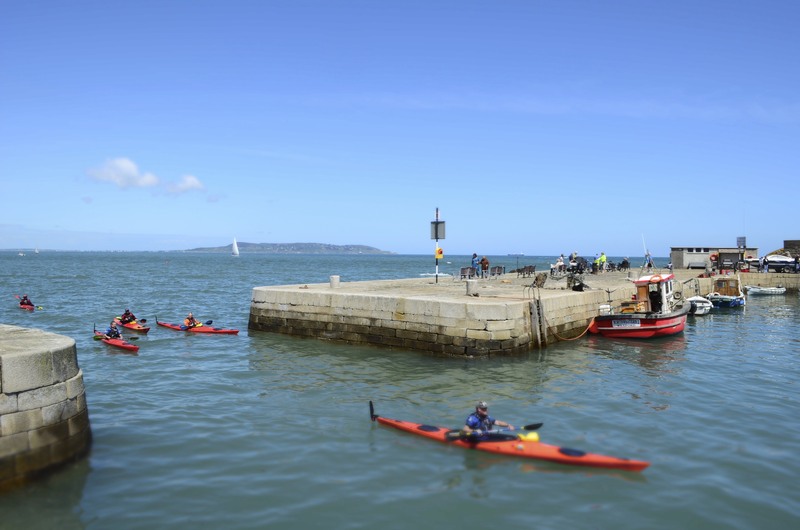 Dun Laoghaire is by far the largest and most popular of these, but Dalkey’s Collimore Harbour is a gem not to be missed. The sweeping Killiney Coastline is Dublin’s Bay of Naples, and home to many a famous name. The views can be breathtaking, and struggling with the bike up its very steep hills is well worth it for the thrilling descent on the other side. Dalkey is an historic village on the southern coast which has managed to resist modern development in order to maintain much of its scenic charm. They are a whole host of excellent places to eat and drink here. 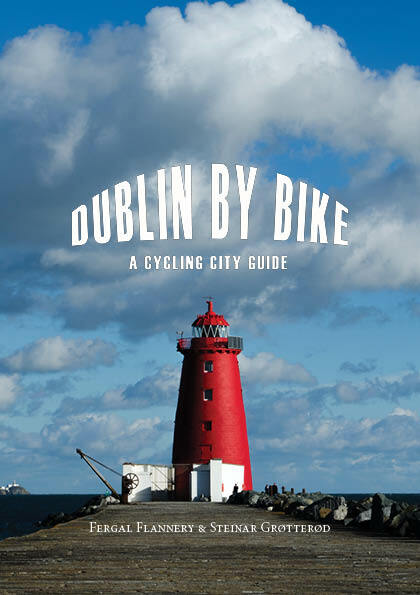 Poolbeg Lighthouse is located on the end of a very long harbor wall between Sandymount and Ringsend, and is a short detour from the route. It was first constructed in the 18th century and is a popular walk affording extraordinary views of the bay. The surface is very rough hewn granite blocks, so its not the most comfortable of surfaces to cycle, but its well worth the effort. Care should be taken at high tide or poor weather as waves can sometimes sweep over the harbor wall. More information about Dalkey can be found on http://www.ilovedalkey.com. Dalkey Island is 25 acres in size, with 3 smaller islands to the northern known as Lamb Island, Clare Island and Maiden Rock. Dalkey Island meaning “Thorn Island” was home to some of the first Stone Age settlers on the eastern coast, while there is also evidence of activity from the Neolitic and Bronze Age Periods. The Martello tower and gun battery were built by the British in 1804 as a coastal defence against an expected Napoleonic invasion. The main purpose of the Dalkey Martello was both as a look out point and gun emplacement and is thus perfectly located on the highest point of the island, with a clear view in every direction.